A wide octagonal bezel, eight hexagonal screws, and a porthole design: This best describes the Royal Oak. This coveted luxury watch from Audemars Piguet is an icon of the watch industry. Top models feature a perpetual calendar and minute repeater. The Audemars Piguet Royal Oak was the world's first luxury sports watch. The Swiss manufacturer revolutionized the entire watch industry with this stainless steel piece. In the early 1970s, luxury watches were still being made exclusively out of precious metals, such as gold and platinum. When it came to price, the Royal Oak far exceeded some gold watches: It cost over 3,600 CHF at its introduction in 1972. At 39 mm, the Royal Oak was considered large at the time, hence its nickname "Jumbo." Over the years, its avant-garde porthole design earned a cult following. All this and more led to the Royal Oak becoming one of the world's most highly coveted watches. Mohammad Reza Pahlavi – the Shah of Iran from 1941 to 1979 – was one of many who helped contribute to this timepiece's fame. Today there are many editions of the Audemars Piguet Royal Oak, from classic two-hand versions in stainless steel to rose gold chronographs, all the way to the Grande Complication with a perpetual calendar, chronograph, and minute repeater. One highlight is the Royal Oak RD#2, the world's flattest automatic watch with a perpetual calendar. At only 6.3 mm thick, it is even thinner than the Royal Oak "Jumbo" Extra-Thin, which measures in at 8.1 mm. 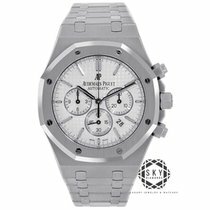 How Much Does an Audemars Piguet Royal Oak Cost? Of the brand's current catalog, the Audemars Piguet Royal Oak "Jumbo" Extra-Thin with the reference number 15202ST is the closest thing to the original model from 1972. Set aside around 29,500 USD for a current "Jumbo" in mint condition. At 27,900 USD, pre-owned examples are only slightly more affordable. These prices have been on the rise in recent years, making this particular Royal Oak a great investment. This is also true of the titanium and platinum model introduced in 2018. This watch is characterized by its "Smoked Blue" gradient dial. Limited to 250 pieces, this luxury timepiece costs about 56,700 USD new. You can find early models from the 1970s under the reference number 5402ST. Pre-owned pieces sit around 29,500 USD, though some may cost upward of 47,200 USD. Prices for watches with this reference number have also steadily risen over the last few years. The three-hand variants are almost 12,000 USD less expensive than those with two hands and come in a number of sizes. The current 37-mm editions are suited for both men and women. You can purchase one of these somewhat smaller watches for around 17,500 USD. If you prefer the classic 39-mm size, you should take a closer look at the reference number 15300ST. Examples in mint condition cost about 16,500 USD, while pre-owned pieces cost 15,600 USD. The ref. 15300ST is also a safe investment that is likely to continue to increase in value. This also applies to the 41-mm version with the reference number 15400ST, which goes for 18,400 USD new and 16,900 USD pre-owned. 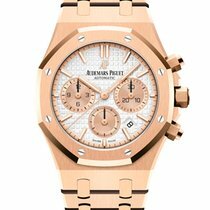 Prices for Gold Watches and Women's Models in "Frosted Gold"
Audemars Piguet has numerous gold versions of the Royal Oak in their catalog, from white to yellow to rose gold. The "Frosted Gold" variants are particularly striking and rather feminine thanks to their sparkling surfaces. Audemars Piguet developed these gold watches in cooperation with jewelry designer Carolina Bucci. You can get a mint-condition 33-mm Royal Oak in white "Frosted Gold" with a quartz movement for around 36,900 USD. The rose gold edition with a 37-mm case and automatic caliber comes in at over 50,500 USD new. Pre-owned examples are currently quite hard to come by, as the manufacturer first introduced these models in 2017 in celebration of the 40th anniversary of the Royal Oak Lady. The 39 and 41-mm gold versions of the Royal Oak are aimed more at men; however, it's not unheard of for women to sport a watch of this size. A 39-mm Royal Oak "Jumbo" Extra-Thin in rose gold costs about 47,200 USD in mint condition. Pre-owned pieces are only slightly less expensive. The yellow gold version demands about 55,500 USD new and 48,700 USD pre-owned. A new rose gold Royal Oak Selfwinding with a 41-mm case sells for around 43,700 USD. You can get a pre-owned model for about 38,400 USD. The Audemars Piguet Royal Oak Perpetual Calendar is one of the flattest automatic watches to feature this complication. This 41-mm watch comes in gold, stainless steel, or ceramic. Ceramic pieces cost almost 148,000 USD in mint condition and 132,000 USD pre-owned. Those in stainless steel are markedly less expensive, coming in at around 60,600 USD new and 56,500 USD pre-owned. At about 87,800 USD, even never-owned models in yellow gold are more affordable than the ceramic watches with a perpetual calendar. Pre-owned yellow gold pieces go for a good 79,500 USD, while those in rose gold cost a few thousand dollars less. The chronograph is one of the most popular complications, so it should come as no surprise that it appears in the Royal Oak collection. In fact, the chronograph models are even less expensive than the classic "Jumbo" version. You can buy a mint-condition variant in stainless steel for just under 24,000 USD and a pre-owned example for 23,000 USD. In rose gold, the Royal Oak Chronograph costs 50,800 USD new and 46,100 USD pre-owned. What are the Royal Oak's distinctive features? The Royal Oak can be identified by its octagonal bezel, eight hexagonal screws securing the bezel to the case, and an integrated stainless steel bracelet. Even the dial is a distinctive element of the Royal Oak. A rare, automated engraving machine is used to engrave a "tapisserie" pattern on the dial. Audemars Piguet refers to these patterns as either "Petite Tapisserie" or "Grande Tapisserie." All of these features come together to resemble a ship's porthole. The Royal Oak has a retro feel to it, with a timeless design inspired by the 1970s. Gérald Genta, the most famous watch designer in the world, is responsible for creating the look of the Royal Oak. Genta also designed watches such as the Nautilus from Patek Philippe and the Ingenieur SL from IWC (International Watch Company). What are the different model versions? Currently, there are over 100 different versions of the Royal Oak in the collection. It is available in stainless steel, gold, with or without diamonds, with two or three hands, or with a chronograph function, among other options. The 33 and 37-mm watches are well suited for more delicate wrists. The 33-mm version is quartz powered. Diamonds on the bezel, dial, or case increase the value of some models. You have the choice between a classic metal bracelet or an alligator leather strap in black, white, gray, blue, or brown. The case is also available in 18-karat yellow, white, or pink gold. Highlights of the series are watches with skeletonized dials and movements. The individual movement pieces are so finely finished that they become pieces of art in their own right. You can see the caliber from the front and back in these so-called "openworked" models. The watch has a sapphire glass case back, giving you a look at the automatic movement. Some of these models even have a tourbillon. Fans of the original Royal Oak should consider reference number 15202ST. Like its predecessor from the 1970s, this watch has a diameter of 39 mm. With a thickness of 8.1 mm, the wristwatch is comfortably thin; it disappears under shirt cuffs without a problem and goes well with a suit and tie. The somewhat larger 41-mm version is only slightly thicker at 9.8 mm. There are few differences between the current model with reference number 15202ST and the original Royal Oak: You are now able to view the movement through the sapphire glass case back, for example. Also, the color of the date disc now matches the dial; the first Royal Oaks had white date discs with black numerals. The automatic caliber 2121 powers the 39-mm Royal Oak. This movement is incredibly flat at only 3.05 mm thick. It also has a 40-hour power reserve. Its balance wheel frequency is 19,800 alternations per hour (A/h), equal to 2.75 Hz. The movement is comprised of 247 individual components. This Audemars Piguet movement is based on the Jaeger-LeCoultre caliber 920. Without a date function, it's an impressive 2.45 mm thin, making it one of the flattest automatic movements with a central rotor in the world. Patek Philippe and Vacheron Constantin use this movement as well. 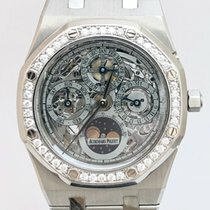 The earliest ideas for the Audemars Piguet Royal Oak reach all the way back to 1971. At the time, Georges Golay was the general director of the family business. 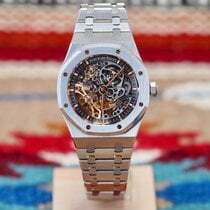 Carlo de Marchi, the Italian distributor of Audemars Piguet, turned to Golay in 1971 and requested a new, multi-purpose watch. The watch was to be suitable for taking a drive in your car, going on a cruise, spending a night on the town, or going out to the club. De Marchi suggested stainless steel for the case and bracelet material. Gérald Genta was tasked with designing the first Royal Oak. Within a few days, the renowned watch designer submitted his first draft with traditional diving helmets as his inspiration. The result was a wide, octagonal bezel with eight hexagonal screws, resembling a ship's porthole. The grooves in the screws all align perfectly, which was made possible by screwing the bolts in from below. Moreover, the heads of the screws are even with the bezel and connect it and the rubber seal to the case. The screws have both a practical and an artistic function. Furthermore, Genta suggested an integrated steel bracelet which narrows as it approaches the clasp. The responsible parties at Audemars Piguet liked his ideas so much, they didn't change a thing, and the watch, known internally as "Safari," was presented at the 1972 Basel watch trade show. For the first Royal Oak prototypes, Audemars Piguet used cases made of white gold, as the material is more malleable and easier to polish than stainless steel. The Royal Oak wasn't initially a huge hit. With a diameter of 39 mm, it was much larger than many other luxury watches. It was also expensive for a stainless steel watch, costing 3,650 Swiss francs. In total, only 400 watches were sold in the first three years. Above all, German customers appreciated the avant-garde and flat design. The watch eventually became a bestseller and the brand's flagship watch.